At tonight’s meeting of the Ocean Beach Planning Board, the Board will review the application of property owners who want their lot on West Point Loma Boulevard to be the next gentrified property on the 5100 block. The Board meets at 6:00 p.m., tonight, Wed., Feb. 6th, at the Ocean Beach Recreation Center – 4726 Santa Monica Ave. The owners of the Douma residence at 5168 West Pt Loma Blvd are applying to be the third property that is allowed to circumvent the OB Precise Plan by obtaining variances from the City permitting them to demolish the existing duplex and build their huge, 3-story, single family residence. However, what the Planning Board does tonight with their application is framed by the on-going controversies and disputes between the Board and the City on the issue of the City granting building variances that allow property owners to bypass the blueprint for development in the village, the OB Precise Plan. The Board, by law, is a publicly elected advisory body that makes recommendations to the City and is supposed to uphold the Precise Plan. The Board recently called for a “moratorium” on the City granting what the Board views as improper variances to property owners on that block. That block, the 5100 block of West Pt Loma, is considered the front line of OB’s battle against gentrification. Gentrification occurs when existing housing stock is demolished and the class of people previously living in it cannot afford the newly constructed housing that takes its place. Northwest OB, where the 5100 block is situated, has long been an area of the beach that has had affordable rents over the decades. This is threatened by gentrification. Also, tonight, Chair Jane Gawronski is expected to announce that the Board received a letter from Mayor Bob Filner on the Board’s call for a moratorium on variances. Gawronski said the letter is a positive response in their battle with the Planning Department. Steve Grosch, from OB Community Development Corporation, will give an update on the future redevelopment of Veterans Plaza. Former City Councilmember Byron Wear will present the Ocean Beach Lifeguard Bronze Memorial; this is PR to promote what’s called “the first phase of future improvements and enhanced public access to the area surrounding the Ocean Beach Lifeguard Station”; Wear is also a former lifeguard. Also, the Election Committee report on the upcoming Board Election in March 2013 with action needed on propositions submitted by the public and/or members of the Planning Board.. OCEAN BEACH (Process 3) – Coastal Development Permit, Neighborhoods Development Permit for Environmentally Sensitive Lands and a Variance to Demolish an existing duplex and construct 1,712 square foot, three , single-family residence with reduced dedicated parking area on a 0.05- acre site. The Property is located at 5168 W Point Loma in RM-2-4 Zone within the Ocean Beach Community Planning Area, Coastal Overlay Zone (Appealable Area), Coastal Height Limit overlay Zone, Airport Approach Overlay Zone, Federal Aviation Administration (FAA) Part 77 Noticing Area, First Public Roadway, Historic District-Ocean Beach Cottage Emerging District, Parking Impact Overlay Zone (Coastal and Beach) and Residential Tandem Parking Overlay Zone, and Council District 2. OBPB 1. After public and Board discussion, the Board is expected to vote to recommend approval or denial of the project. 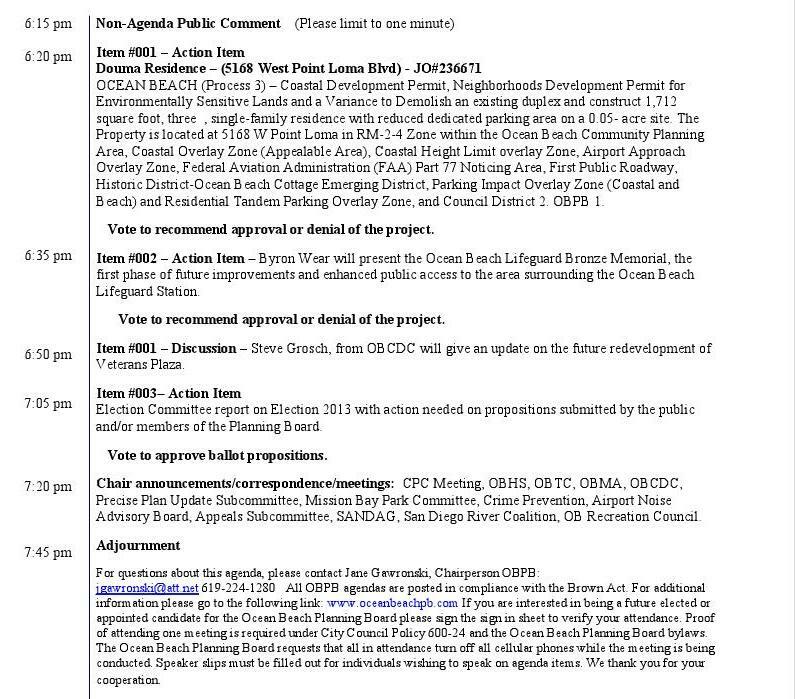 Newer Article: Can OB Planning Board Claim “Victory” in Calls for Moratorium on Variances on West Pt Loma Blvd?